Green Heavy Polishing Pad - Light Cut, Heavy Polish Minor Scratch and Swirl Remover. 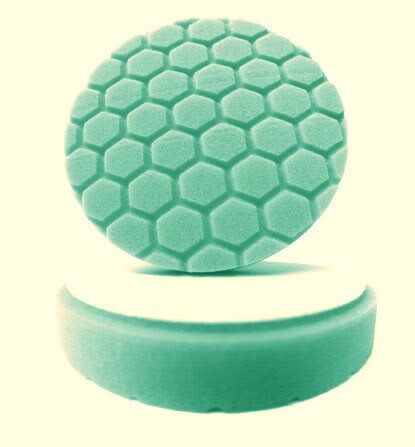 4" Green Heavy Polishing Pad - This pad is is used by Mercedes Benz at OEM level and is designed to be used with a random orbital polisher. It produces less spot heating and has a unique compression/load/deflection ratio which means it conforms quickly to contours. It is a high strength foam with 60 pores per sq. inch yet is softer and more forgiving than our regular foams which have 80 pores per sq. inch. This pad is tough enough to remove swirls and scuffs while at the same time producing a high gloss swirl free finish. This foam is also ideal for applying one-step cleaner waxes. It is a balance of polishing and finishing that is perfect for all-in-one product application.